Andover, MA – Royal Philips (NYSE: PHG; AEX: PHIA) today announced new study results demonstrating an insightful correlation between chronic conditions and falls risk. Philips’ researchers retrospectively analyzed the records of 145,000 seniors equipped with a standard Philips Lifeline medical alert service or a medical alert service with AutoAlert (automatic fall detection) between January 2012 and June 2014. Data showed seniors with chronic conditions fell and required emergency transport up to 54 percent more often, compared to their peers with no chronic conditions. Additionally, the analysis revealed that seniors with physical conditions not typically tied to frailty, including COPD and diabetes, also were shown to fall more often. In the United States, one in three seniors fall each year1 and about 75 percent of healthcare costs are spent on chronic diseases2. 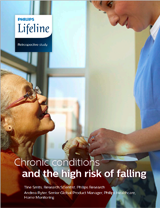 Understanding the fall risk associated with seniors, especially those living with chronic conditions, is the first step to prevention, and by providing prompt care, outcomes can be improved and costs related to direct medical assistance better managed. Driving visibility to the need to take preventative steps can help this population prepare appropriately and help them get fast access to help when needed. With 5.3 million Americans suffering from Alzheimer’s3, 24 million from COPD4 and 29 million from diabetes5, chronic conditions are a growing concern in the U.S. In fact, 80 percent of the senior population has at least one chronic condition and 68 percent has two or more6. Among Philips Lifeline HomeSafe with AutoAlert users, seniors who self-reported suffering from three chronic conditions had 15 percent more falls that required hospital transport, and those with five or more conditions had 40 percent more falls than those with no chronic conditions. Within the study population, 72 percent reported having one or more chronic conditions, with 20 percent reporting five or more. Heart condition by 29 percent. The complete findings7 are available at www.lifeline.philips.com/resources/fall-risk. Philips is a leading provider of population health management solutions that improve outcomes and efficiency through coordinated care, real time analytics and patient engagement services. Through Philips Lifeline with AutoAlert, which can provide access to help if it detects falls that otherwise would not be reported, seniors can maintain their independence and avoid potential hospitalization resulting from complications of long lie times8. Additionally, in its continuing effort to support this population, Philips Home Monitoring recently launched CareSage in the U.S., a new predictive analytics engine that provides analysis of real-time and historical data from healthcare providers and Philips Lifeline AutoAlert technology. CareSage proactively identifies patients most likely to need to be transported to a hospital within the next 30 days so clinicians can provide timely intervention. 1Tromp AM, Pluijm SMF, Smit JH, et al. Fall-risk screening test: a prospective study on predictors for falls in community-dwelling elderly. J Clin Epidemiol 2001; 54(8):837–844. 7All data within the study is reported with a +/- 95% confidence interval. 8AutoAlert does not detect 100% of falls. If able, seniors should always push the button if they need help.